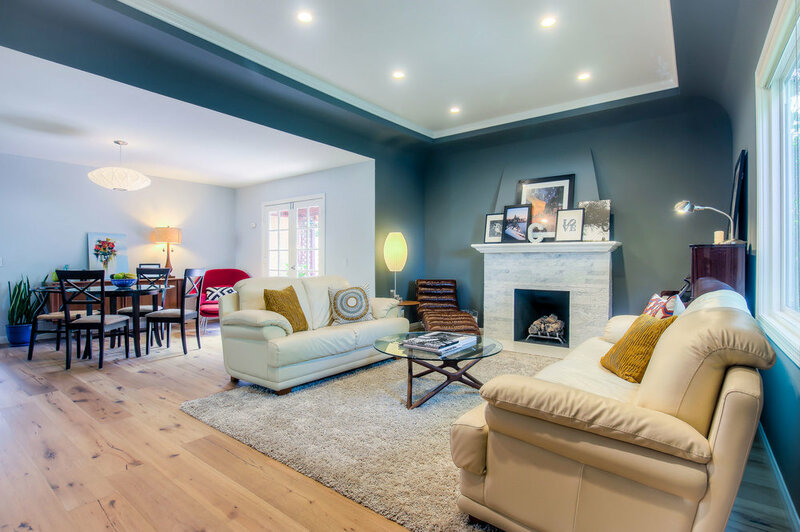 We are proud to showcase this beautiful complete design and remodel in Culver City, CA. We remodeled this two story home in about 2.5 months. The remodel consisted in a 3 bedrooms 3 bathrooms, a full kitchen, two living rooms, an office and a laundry room. Check out the before and after here to see the complete transformation! Check out full project and before & after photos! In this kitchen design and remodel, we opened an arch window to the living room and removed some partition walls to create an open kitchen floor plan. We fabricated custom two tone cabinets, Ceaser Stone quartz counter tops, and chevron white porcelain tiles. Finally, we installed engineered white oak floors throughout the entire first floor of the house. In this room, we installed engineered white oak floors, we re-designed the fireplace using natural stone from Jakarta, and painted the room with a beautiful dark grey color. Master bathroom remodel: in this bathroom, we installed wood style porcelain tile flooring. We installed white marble and aluminum mosaics on shower accent wall, and white porcelain large tiles for the side walls. To enclose the shower, we fabricated a custom frame less glass shower door. We also installed a pre-made large double sink vanity with marble counter tops. For the guest bathroom remodel, we used grey mosaic marble tile on floors, and Spanish porcelain subway tiles on shower walls and bench. In the living room, we installed engineered white oak floors, we re-designed the fireplace using natural stone from Jakarta, and painted the room with a beautiful dark grey color.